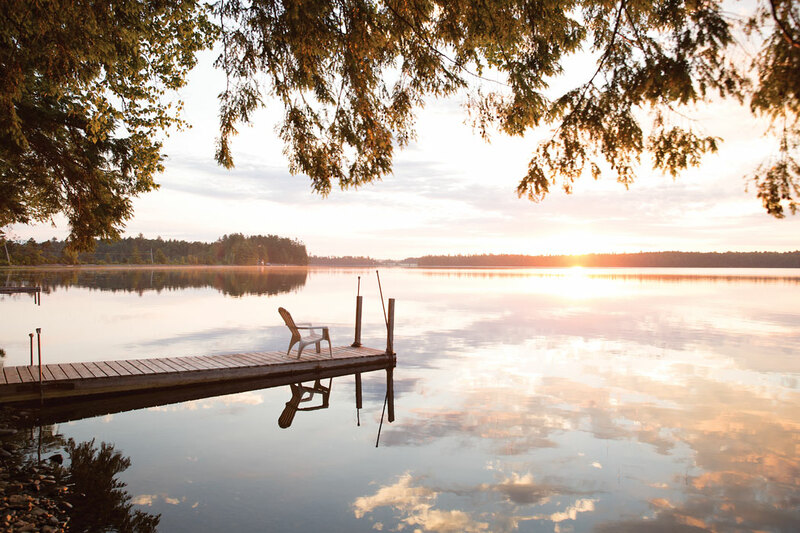 Sunrise over Big Lake at Chet’s Camps. 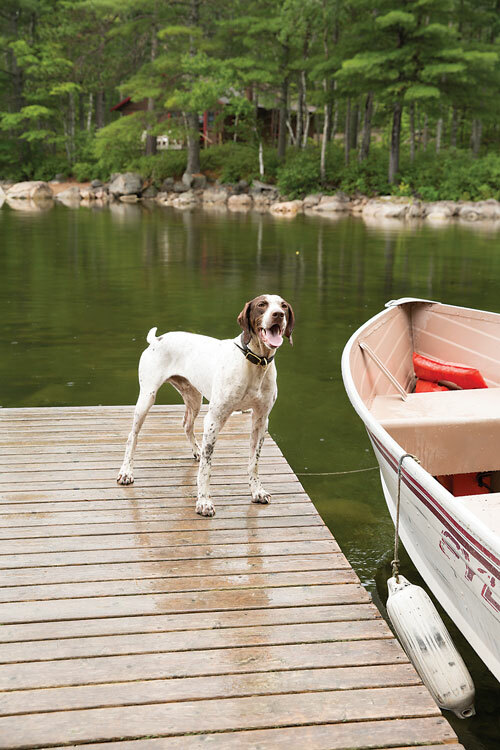 For the last five summers, my husband, two young sons, and I have been making the 5½-hour trek from southern Maine, where we live, to a fishing camp called Chet’s, on the shores of Big Lake in the plantation of Grand Lake Stream near the Canadian border. Skiffs at Chet’s Camps on Big Lake. 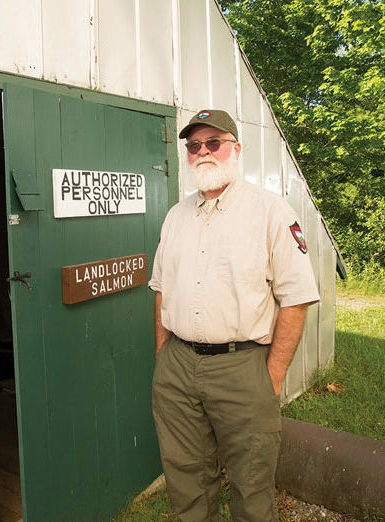 Stocks of landlocked salmon have lured anglers to Grand Lake Stream for nearly 200 years. After the better part of a day of songs and road snacks, we make our way down a long gravel driveway that winds through towering white pines and hemlocks to arrive at a handful of cabins built in the 1930s by Chet White, who operated the camp with his wife, Pauline, for 30 years. Though they have some modern appointments, they remain mostly as Chet first conceived of them: small, rustic structures so close to the lake you can smell its soft and muddy fragrance while lying in bed at night. It’s like stepping back into a world unchanged by the internet and all the gadgets that come along with it. 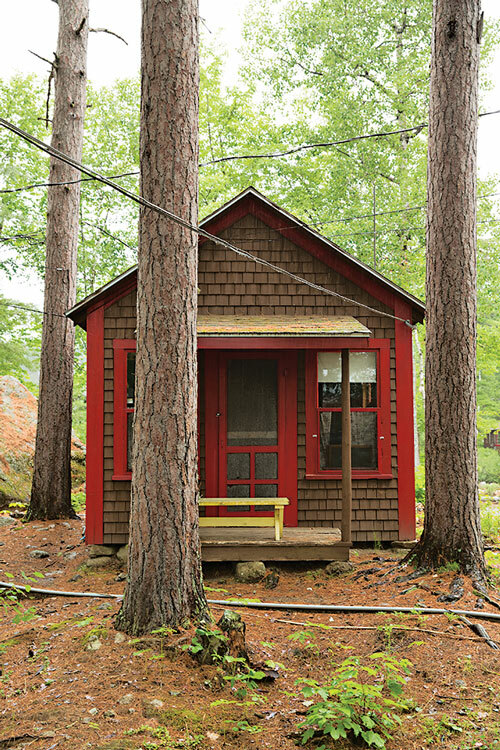 A family can rent a simple, small cabin pretty affordably, and there are hundreds of thousands of preserved and protected acres of land around the camps, making the area a veritable wildlife refuge. Indeed, in Grand Lake Stream, and on the shores of Big Lake, the mission to preserve, to hold onto a simpler way of doing things, tugs harder than the impulse to profit. 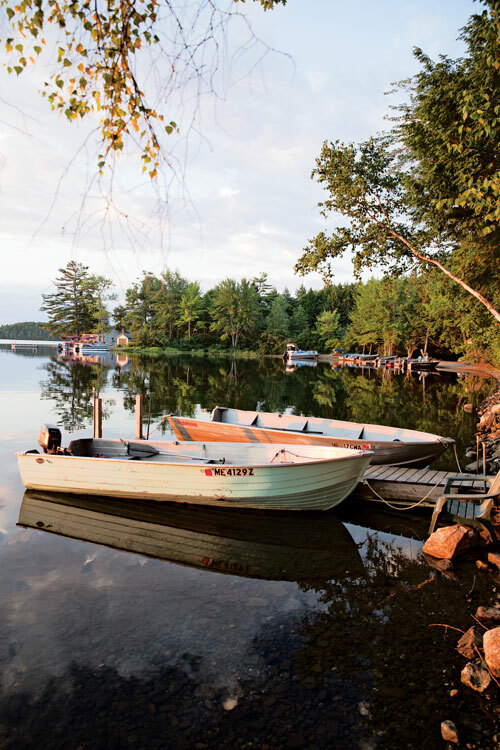 In many ways, Grand Lake Stream is a prototypical Maine North Woods town: small, isolated, aging, reliant on its natural resources. And like similar communities, Grand Lake Stream finds itself navigating a series of ineluctable and interrelated tensions: between development and conservation, stewardship and wildness, consumptive and non-consumptive recreation, stasis and change. 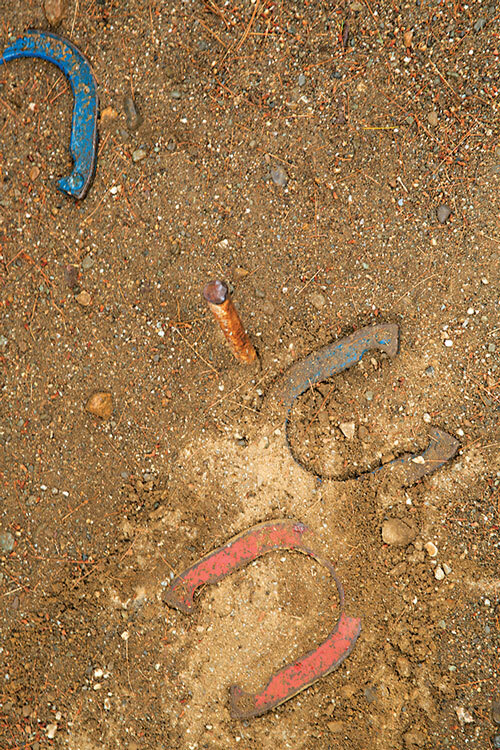 Residents rallied to preserve not only the land, but also, as they saw it, their way of life. The most recent example of such frictions arose last year when Grand Lake Stream was awarded a $650,000 grant for housing and economic development projects to attract young families and create jobs. 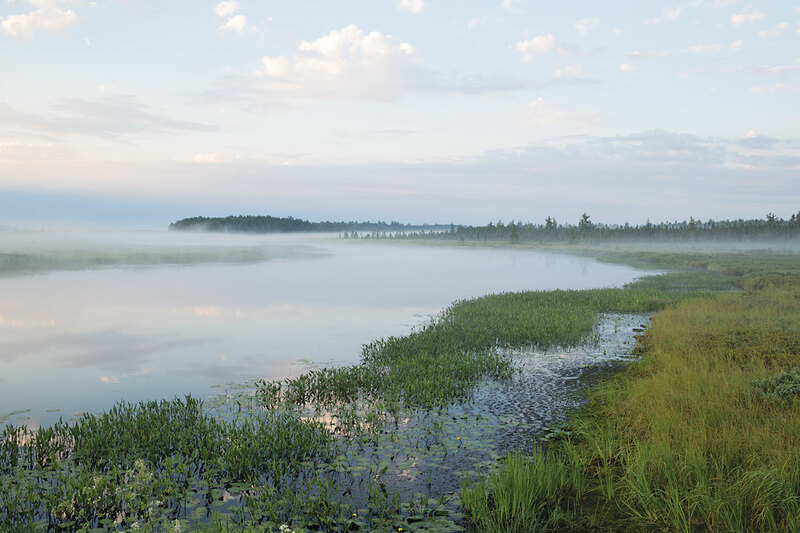 The grant was the conclusion to a seven-year-long effort to preserve 21,780 acres of forestland and support Grand Lake Stream’s traditional wilderness economy, a complex collaboration that involved Downeast Lakes Land Trust, Lyme Timber Company, CEI Capital Management, the town, and other partners. To Lou Cataldo, Grand Lake Stream’s first selectman at the time of the award, the money is a great gift. All the town has to do to make good on the contract is develop some combination of affordable housing, community facilities, or light industry. Lyme Timber Company has donated 127 acres of land for the projects. Weatherby’s Resort co-owner Jeff McEvoy wets a line. People know they’re sitting on a trove of beautiful wild land that makes their lives richer and enriches the lives of those who visit. Grand Lake Stream’s population currently hovers around 70–100 year-round residents, and more than half are in their 70s and older, says Elaine Brown, who succeeded Cataldo on the select board in April and is director of the Grand Lake Stream Historical Society. Grand Lake Stream is a “dying community,” Brown says. “Some of us won’t be here in 10 years.” There’s no industry beyond the sporting camps, she adds, and many of the people who own those camps and lodges want out. West Grand Lake into Big Lake. Folks have made the pilgrimage here to fish for native landlocked salmon since the early 19th century. 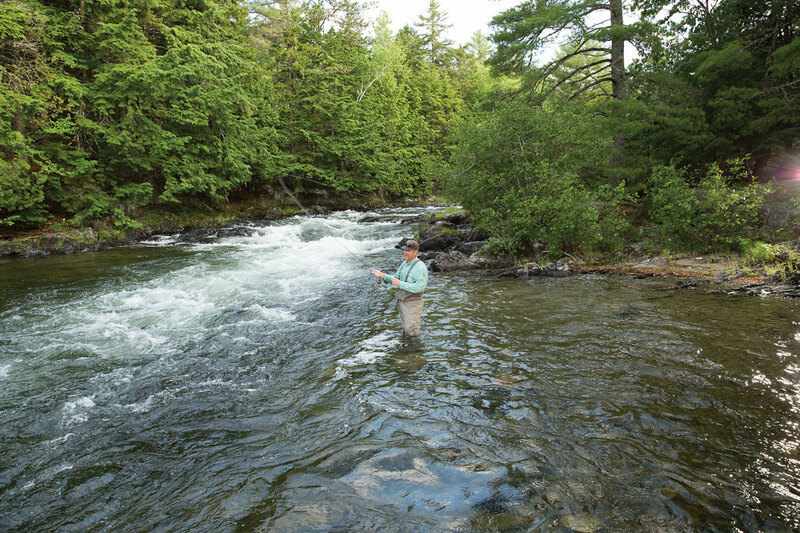 At that time, guides from the Passamaquoddy tribe helped anglers find sweet spots in the stream. 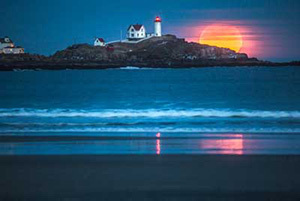 Today, the Passamaquoddy Nation’s Indian Township (population 718) is settled on Big Lake’s northeastern shore, and its reservation comprises almost 44 square miles, stretching from Big Musquash Stream — which flows through some of the most searingly beautiful marsh you’ll ever see — down through “the strip” of government housing on Route 1, and into the town of Princeton. David Marsanskis, fish culture supervisor at Grand Lake Stream Fish Hatchery. and maturing them in a spring in the woods. Eventually, this became a state fish hatchery, which today stocks the stream with salmon to ensure that it won’t be fished out. Grand Lake Stream’s population peaked around 500 in the 1870s when a Massachusetts company called F. Shaw and Brothers set up what was then the world’s largest tannery, using the red-brown bark of native hemlock trees in its tanning process. But the tannery foundered after one of Boston’s largest boot manufacturers failed, and by 1898, it was bankrupt. Grand Lake Stream’s population nosedived to 221. In the ensuing years, people looked to the land to make a living, offering wilderness experiences to sportsmen who came to fish and hunt. Locals opened their homes to boarders and built lodges, including the White House, now the stately Weatherby’s lodge, which sits above the stream on the main road through town. More lodges and camps soon sprang up around the stream and surrounding lakes, among them Chet’s. Meanwhile, the paper and timber companies, which had dammed the stream and had been logging the land since the middle of the 19th century, began buying up and aggressively cutting large tracts of land, introducing an ideological schism that persists today. On the one hand, Grand Lake Stream needs industry to survive as a year-round community. On the other hand, people know they’re sitting on a treasure trove of beautiful wild land that not only makes their own lives richer, but also enriches the lives of those who visit. 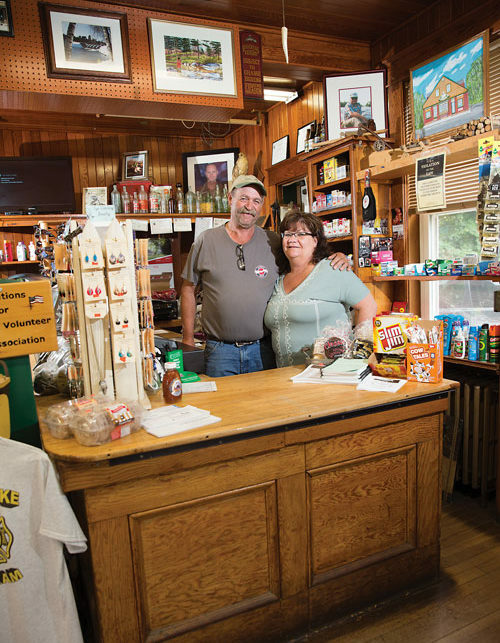 Brinda Leighton and Les Severance bought the Pine Tree Store after Les was laid off from the now-shuttered Lincoln Paper and Tissue mill. In 1992, Grand Lake Stream’s wilderness guides and lodge owners grew alarmed after pulp-and-paper company Georgia-Pacific revealed plans for a 260-acre subdivision of vacation homes on the stream’s shores. 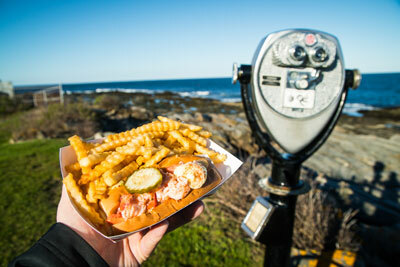 Working with Maine Coast Heritage Trust, residents rallied to preserve not only the land (now managed by Maine Inland Fisheries and Wildlife), but also, as they saw it, their way of life. Then, a few years later, came another scare, as Georgia-Pacific sold 446,000 acres to timber investors. Again, residents were inspired to action. This time, they realized they needed their own land trust to protect the forests and lakes that are their livelihoods. Today, the trust’s ongoing conservation efforts coincide with a national trend away from hook-and-bullet recreation and towards hiking, paddling, ATV riding, and mountain biking. And some Grand Lake Stream residents, guides, and sporting camp owners are trying to figure out how — and whether — to adapt. Hunting guide and canoe artisan Dale Tobey. The work of the DLLT is not the only human undertaking that businesses like McEvoy’s rely on. Because of the hatchery, 98 percent of the fish in the stream aren’t technically wild. 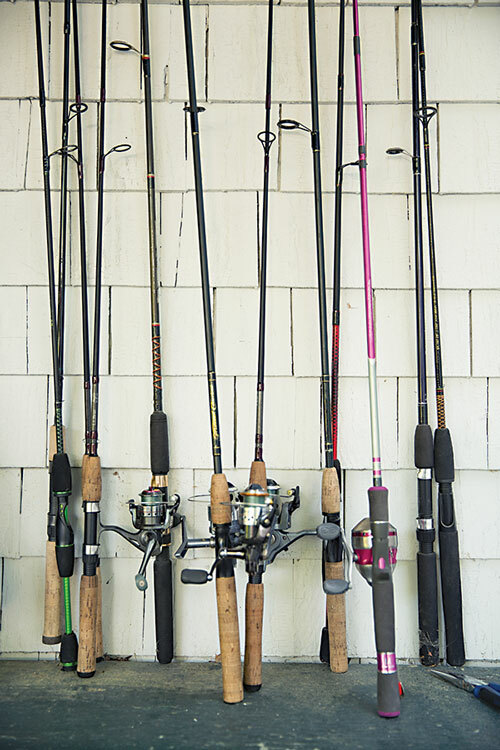 “I’d like to see more wild fish,” McEvoy says, but without the hatchery, there’d be no fish at all because of the intense pressure from anglers. If some dyed-in-the-wool Mainers find the “wild” experience of their childhoods slipping away, it’s clear that Grand Lake Stream is still wild enough for hunters from places like New Jersey, Pennsylvania, and New York who hire guides like Dale Tobey, who says they’re “hungry for the outdoors.” Born and raised in southern Maine, Tobey worked for years as a highly skilled laborer in the construction field, but he’d longed to live in Grand Lake Stream ever since visiting the area in 1975, when he was just out of high school. 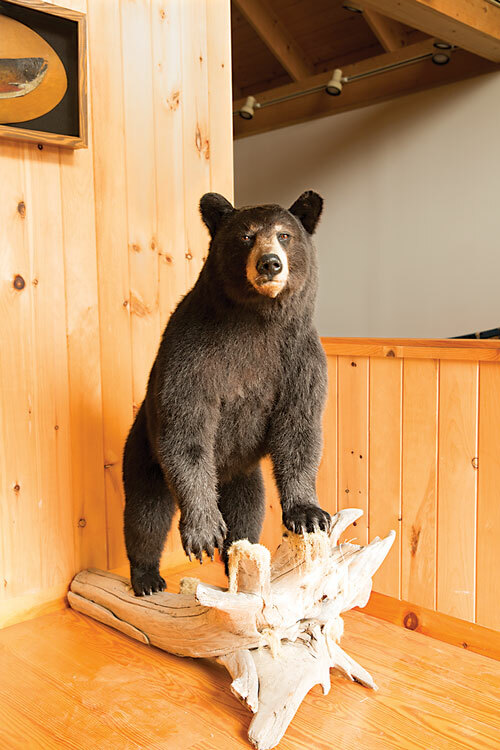 He and his wife finally put down roots in 1995, and Tobey has made a name for himself as a bear-hunting guide and as a master craftsman of Grand Lake Stream canoes, which fetch $6,000 apiece (the style is distinguished by its length — 20 feet — and its square stern, which accommodates an outboard motor). 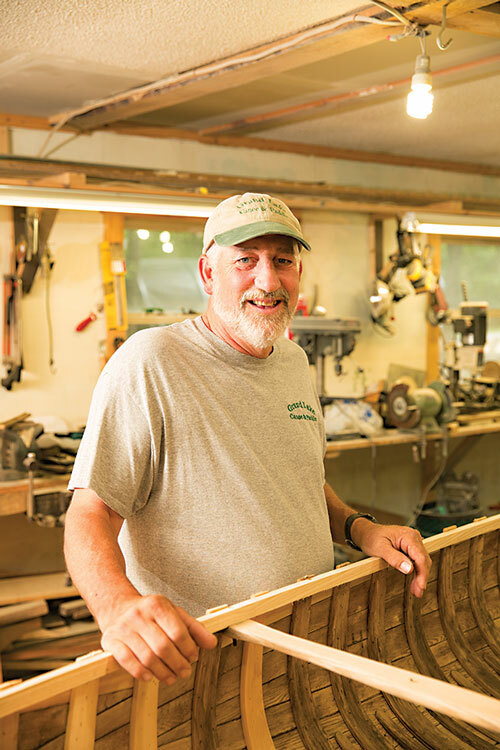 I heard of Tobey through word of mouth, and arrived at his shop early one evening just as he was finishing up his work for the day on a canoe he was restoring for a client. Outside the shop was a truck, its bed filled with cedar logs ready to be stripped. Tobey is reserved, but when he talks about bear hunting and making canoes, he has a lot to say.  He gets a feeling of peace from his time in the Downeast Lakes Community Forest, where he searches for good trees (he goes into the woods with the land trust’s forester to handpick trees from cedar bogs) and good places to hunt. Perhaps quixotically, he’s all but lost his appetite for hunting for himself. “I don’t have to pull the trigger,” he said. “It’s about being out there.” And without that protected land, he said, he’d have no guiding business at all. 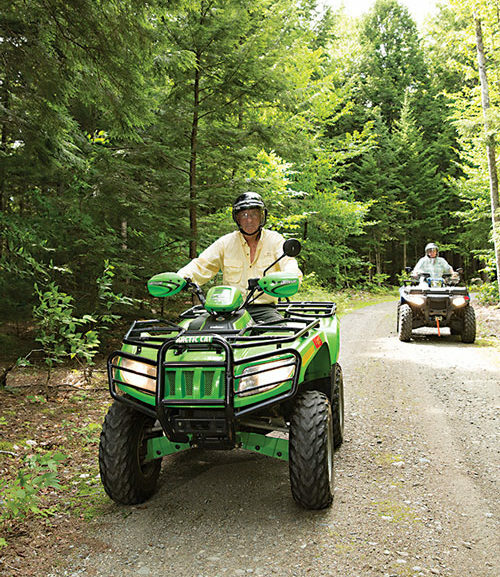 Al and Sue LaPlante, of Chet’s Camps, on ATVs. Shortly after we arrived last summer, Sue and Al LaPlante told us they’re desperate to sell Chet’s Camps. They’re getting too old, they said — he’s 74 and she’s 64 — to keep up with the work of cleaning the cabins, servicing boats, and other maintenance. Finding strong, young people to work is a continual problem for them and almost every other business owner I talked to. Sue and Al weren’t the only ones looking to pack it in. Long Lake Lodge, Grand Lake Lodge, and Leen’s Lodge were also for sale (Leen’s has since been sold). On a rainy Sunday morning, I made my way to Leen’s Lodge, where then-owner Charles Driza was waiting for me in a dining room full of gleaming pine tables. Outside the big, plate-glass windows, the rain made West Grand Lake look like a roiling soup of flint and ash. 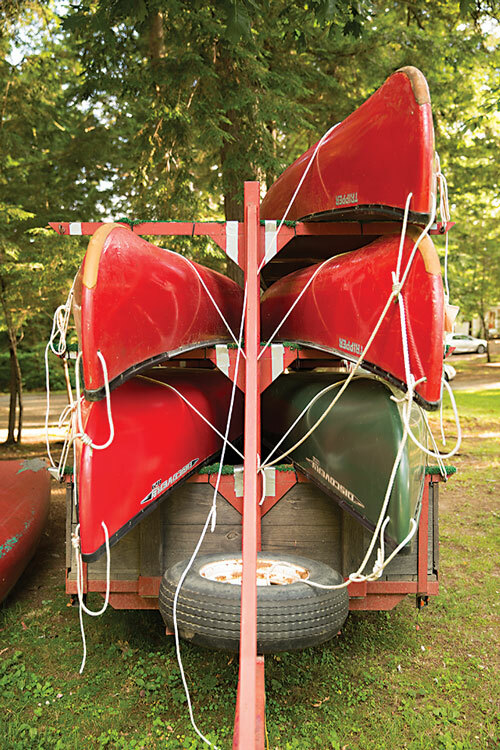 The 77-year-old sporting camp is the kind of place you read about in Richard Ford novels. Red-trimmed brown cabins, each equipped with its own outdoor kennel for hunters’ dogs, dot the lakeshore. In the main lodge, the bright dining room gives way to a den-like lounge filled with leather couches. Shelves are lined with adventure, how-to, and guide books, their spines tattered and multi-colored. Sports and game magazines are piled neatly on dark-wood end tables. A bottle of fine French wine sits on the bar with an opener stuck in it, and enough shiny glasses for a party of eight are just within reach. Everything about the place exudes an aura of evening comfort at the end of a successful hunt. A tall, graying man with a soft face, Driza had run the lodge alone since 2013 when his sister, Cecilia Driza, passed away. He guided guests who want to hunt upland birds, like woodcock and grouse, sometimes taking them out past the huge swath of DLLT land, as far as 60 miles away to timber company land, where there’s early successional growth adjacent to intact forest, a habitat that attracts migrating birds. Too much timber harvesting is bad for birds, Driza said, but some actually keeps them coming. Charles Driza, former owner of Leen’s Lodge. Even so, he was ready to step away from Leen’s Lodge. It was too hard to find help, he told me, and maintaining the buildings and cooking for guests is a lot of work. He wanted an easier life. It’s in part because of such challenges that Lou Cataldo hopes the high emotions surrounding the economic development grant will level out before the contract expires in 2020, and the people will come to embrace the idea that some new affordable housing can help restore year-round vibrancy to Grand Lake Stream. Of course, Cataldo acknowledges, jobs must be part of the lure too. The nearest big employer is Woodland Pulp, 22 miles away in Baileyville, but he feels the town should work on attracting an employer to Grand Lake Stream itself. 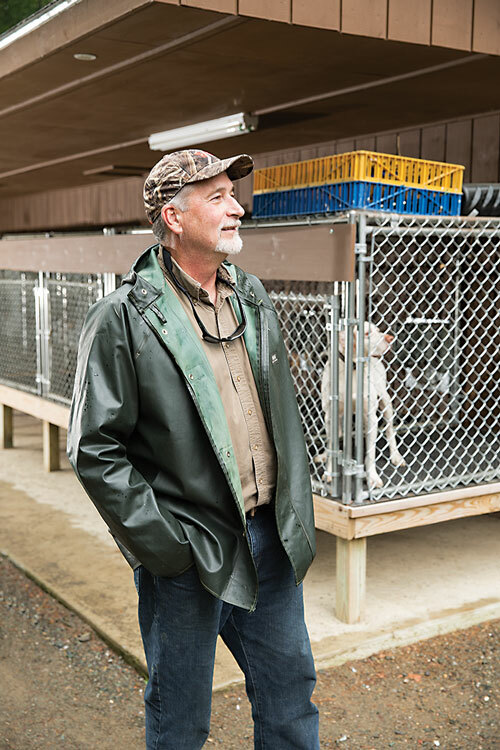 “It’s a tough situation when you’re [literally] on the end of a dead-end road.” The challenge, he says, is to find an environmentally sensitive business that can sustain itself in a landlocked community far from any urban center. Jeff McEvoy is more optimistic. “Look,” he says, “everybody wants it like it used to be. Doesn’t matter how good it is now.” Change is bound to come, but he believes that what Grand Lake Stream has to offer will only grow more precious with time. Caitlin Shetterly is the author of three books, including Modified: GMOs and the Threat to Our Food, Our Land, Our Future, named one of the Best Books of 2016 by Publishers Weekly and Goop. She is currently at work on a novel set in and around Grand Lake Stream. I understand completely the fear of the word ‘affordable housing’ and the implication that it might attract folks who want to.. not live off the land… but live off their neighbors. One of the things these folks might consider is some kind of language that defines the ‘affordable’ aspect, and has a prerequisite that there will be no town/plantation welfare available. Schools are the other problem. In the small town I live in it costs 8000 per student per year. Obviously if someone is paying 2-3000 a year in taxes, that doesnt cover the cost of even one child. So again, maybe the affordable housing is for +55 ? anyway, its an interesting dichotomy of Maine. 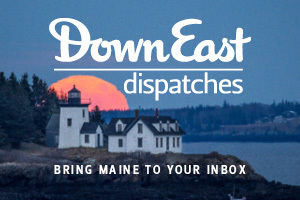 Sometimes Maine folks don’t want any kind of ‘handouts’ if it has onerous ties to it.